Nusra Front aka Al-Qaeda Levant working under the FSA umbrella committed one more of their heinous crimes less reported by western media as it might harm their cause in ‘democratizing’ Syria and promoting ‘free speech’ in the country against the will of more than 19 million Syrians inside the country. The family of Syrian Arab Army Sergeant Youssef Qaiss Abdin received a phone call from his mobile at 4:00 am telling them to check their son’s picture on the Nusra Front social media page. Sergeant Youssef Qaiss Abdin from Damsarkho town in Latakia countryside west of Syria was deployed in Ya’rubiyah at the Syrian – Iraqi borders in Hassakeh countryside in the far north east of Syria (see below map), just like all other Syrian Arab Army soldiers they serve their country wherever duty calls them. Youssef was 23 years old. He was kidnapped one week ago and his family were called from his mobile phone then to inform them their ‘kafir shabeeh is kidnapped’. Kafir means infidel and Shabeeh is supposed to mean thug is used to label any government worker to justify their killing, it’s not limited to SAA servicemen and servicewomen, policemen, post office workers thrown from rooftops in Al-Bab city north of Aleppo because they were Shabeeha, judges kidnapped and slain, professors targeted with bombs planted in their cars and directly assassinated, posting a comment on a FB post earns someone the title of Shabeeha and are killed, lots more and even doctors are assassinated, Dr. Mahmoud Tasabihji the head of University Hospital in Aleppo was assassinated October last year, and just yesterday Dr. Rafic Abbass head of Emergency section in the National Hospital in Qunaitra was field executed by Nusra Front for ‘working with the government’.. And the list never ends, looking at the targets of their crimes gives one the chills on what future these cavemen wants targeting schoolchildren, university students, and destroying the infrastructure. The family of sergeant Youssef opened the net to see what they were fearing, we are not posting the picture here due to its graphic nature, it’s available here: (GRAPHIC Click Here). This is just one more crime committed in the name of each citizen from each country attending the so-called Friends of Syria conferences, with these citizens’ tax money, these citizens’ armies weapons and covered by the leaders and governments ‘elected democratically’ by these citizens, keeping in mind that Syria has never attacked or posed any threat against any of those countries, on the contrary, has always cooperated with each of those countries intelligence services to fight terror and to receive tens of thousands to millions of refugees of atrocities committed in all countries in the old world. How would you feel if the Syrian government pays back these countries by brainwashing the terrorists sent to Syria and sending them back to their own countries, more than 600 European terrorists in the own confession of EU itself, and all others? How would you feel if such death squads with their suicide ideology going on the streets of your cities blowing themselves up in schools, churches, public and private buildings? Think about it and if you accept that to your own citizens, keep quiet or share this post with your friends and ask the officials you ‘democratically elected’ to represent you why they are doing this to the only secular state left in the Middle East? I have stopped watching the perverse violent videos of the “free of Syrians army” scum, but the photos cannot always be avoided. There is something particularly chilling in the ability of these evil, psychopathologic creatures deformed by Mephistopheles, to horrify, more intensely, with their every atrocity. In a new video released, a male voice speaking US English, is heard giving instruction to one of the savage invaders. I pray that he is sent home in a body bag. Lots of love from the Lebanese in the USA to every one in Ireland. OH Cian O’Hare, Wouldn’t that be Wonderful if they all come back in BODY BAGS to their prospective HOMES & COUNTRIES. We are all praying for the VICTORY of the S.A.A. GOD BLESS SYRIA & IT’S PEACEFUL PEOPLE.. If its really him, maybe that was the reason why they killed him so cruel, because he spoke in public against this terrorists?? If someone know if its him or not, then please answer me, thanks. i am so sorry for the soldier and all others in Syria Army.I just want to ask Turkish people one thing. Your sons,brothers,husbands in Turkish Army. Would you like to see them beheaded like that?? 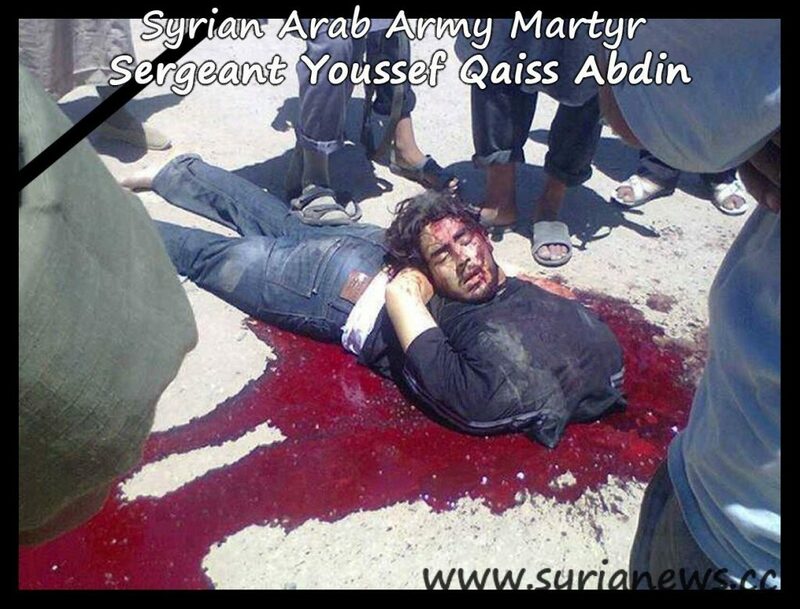 Turkish Government backs up these terrorists in Syria and these peaceful terrorists behead Syrians!